The Commonwealth Ombudsman says decisions to alter benefits above statutory requirements are ultimately commercial matters for individual private health insurers. 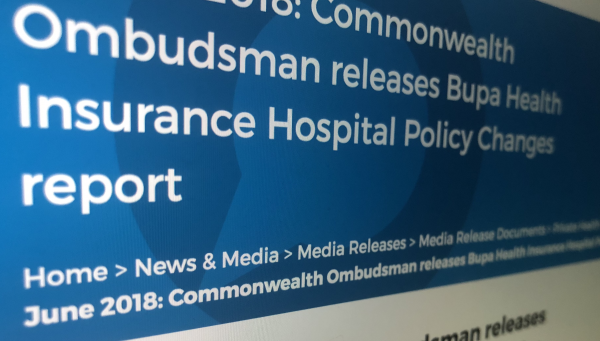 The Ombudsman made the statement in its report on two changes recently announced by Bupa. One change is that policy restrictions will become exclusions under the insurer's basic and mid-level hospital policies. A second change involves its medical gap scheme that will impact non-contracted hospital and public hospital admissions. According to the Ombudsman, "...the change removes an entire benefit from payment, including the hospital accommodation, prosthesis, medical gaps and other benefits previously eligible for benefit. The impact of Bupa’s change to its medical gap schemes and to reduce benefits particularly in public hospitals is less clear." It said the impact on a single hospital admission for an individual may be small, "as the reduction in benefits only applies to the medical gap benefit that Bupa pays above the Medicare Schedule Fee." "The Office acknowledges that it is a commercial decision for private health insurers to determine the extent of cover it provides over and above its statutory requirements as it seeks to balance increasing health costs against the goal of minimising premium increases and, in the case of for-profit funds, achieving a reasonable return on investment for shareholders or owners," it said. The Ombudsman noted other providers have taken similar decisions and that it was imperative that the changes be explained in "plain English and in a way that prominently communicates their potential impact." Bupa announced plans last week to contact all customers regarding the changes and the creation of a Public Hospital Medical Gap Scheme.